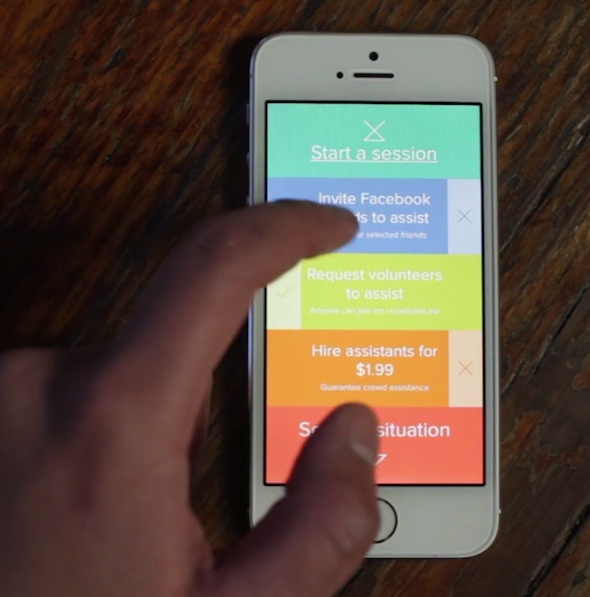 Rhizome | Blog Posts tagged "iphone"
Rhizome | Wed Feb 12th, 2014 12:01 p.m.
For the past few days, using a special algorithm we call "first come, first served," we at Rhizome HQ have been busily setting up blind dates (or trying to). This is not only because we want our community to have love and be happy; it's also a way to celebrate the launch of Lauren McCarthy's Rhizome-commissioned iOS app Crowdpilot. Crowdpilot lets you "crowdsource your social interactions" by audio-streaming them and soliciting advice from your friends, or from total strangers, online. You can download Crowdpilot for free on your iPhone, or you can listen to others' dates, and offer advice to them, by logging in to the project website. Tonight, from 6:30pm-8:30pm EST, we'll be presenting Crowdpilot as Rhizome's third fullscreen frontpage exhibition (following Vince McKelvie and Molly Crabapple). Visitors to rhizome.org will have the opportunity to listen to, and advise on, any ongoing Crowdpilot sessions that are in progress at that time. We arranged two blind dates, but you can also join in as a dater: just run the app during that time, and it will show up on our front page. Jonah Brucker-Cohen | Tue Jul 3rd, 2012 9:39 a.m.
As the iPhone just celebrated its fifth year on the market, artists have already made a substantial dent in the commercially lucrative world of Apple’s AppStore. Despite this success, artists are still pushing forward to build apps that further integrate with the device’s sensors and location-based capabilities. Rather than working solely within the context of software art as I have covered in two previous articles on the subject for Rhizome, there is a focus now on artists who are interacting with the physical world by using the device’s internal sensors, location capabilities, constant Internet connectivity, and built-in cameras. Joanne McNeil | Mon Feb 6th, 2012 11:30 a.m. The day I moved to Brooklyn was the day my iPhone screen first shattered. I struggled to get my keys out of my purse while a group of students were waiting at the door for a friend to buzz them in. Unlocking the door in a confused jetlagged state, I held it open for each of them while juggling several bags with the other hand. After the last student entered the building, I stopped the door with my foot while attempting to redistribute the weight of my belongings. My iPhone slid out of my back pocket and on to the concrete. The resulting spiderweb of a crack had no impact on the iPhone's haptic sensitivity. It looked ruined but worked just as well. Eventually, I got used to reading without much eye strain. There were even some benefits. Everyone knew which phone was mine at dinner parties with iPhones strewn on various counters and end tables. I never worried about dropping it again as the screen wasn’t going to get any worse. And I didn’t worry much about it getting stolen, either. Ceci Moss | Tue Nov 30th, 2010 2 p.m. Artist Paul Slocum's new software company SOFTOFT TECHECH just launched a new app for the iPhone, iPod touch and iPad. Named Sir Sampleton, the app mimics the functionality of the cultish Casio SK-1, allowing the user to sample sounds through a microphone, which can then be played on the keyboard. You can modify the vibrato, note trail length and sample time of the recordings, and the app has a small rhythm bank. Short demo video above, you can download the app here. Created by Kim Asendorf, asdfbmp is a pixel art generator app for iPhone and iPod Touch. 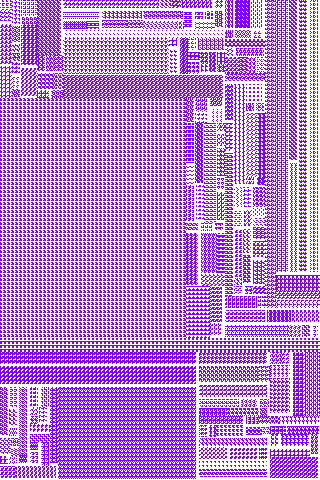 It creates a pixel structure by using a spatial partition algorithm resulting in fields populated by pixel patterns. 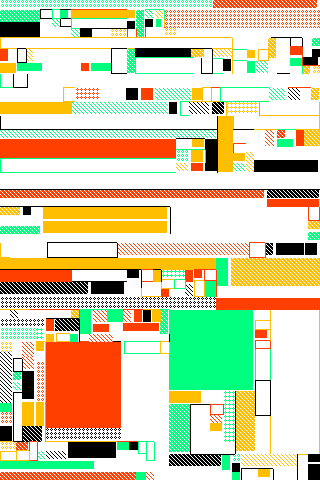 You can choose from 16 bitmap patterns and 32 colours. You can adjust the minimal field size, the probability of a new division and the proportion between horizontal and vertical division. In the draw mode you decide which field is going to be divided. The auto mode divides until there is no more field left. Additionally there is a mode menu where you can choose extra blending modes such as pattern, fill, outline, empty, random. Ceci Moss | Tue Oct 5th, 2010 10 a.m. 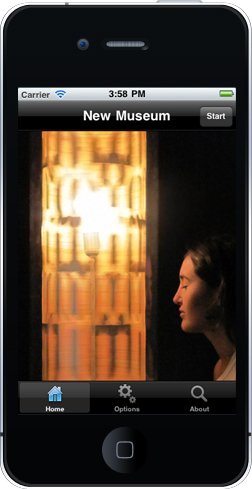 The New Museum's "Brion Gysin: Dream Machine" show is now closed, but a Dream Machine app produced in conjunction with the exhibition, which replicates the flicker effect of Gysin's renown kinetic light sculpture, lives on. Download it here for free. Kunst Bauen is an interactive artwork inspired by 80s video games and the Bauhaus. 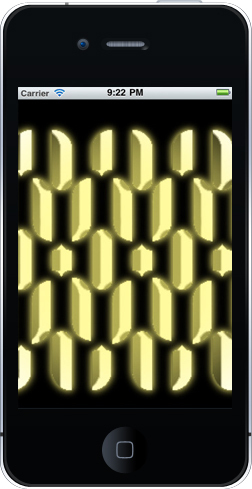 It lets you conjure pulsating, futuristic patterns with just your fingertips. 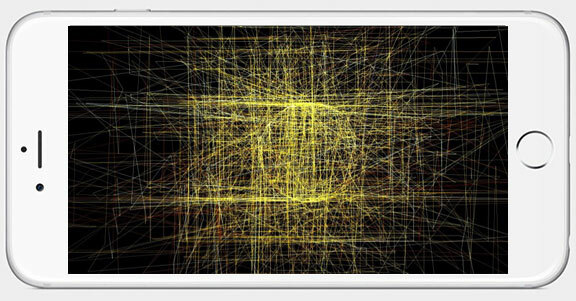 You can stroke the screen to create smooth, swirling shapes, or tap it to make geometric patterns. Jonah Brucker-Cohen | Wed May 26th, 2010 10 a.m. 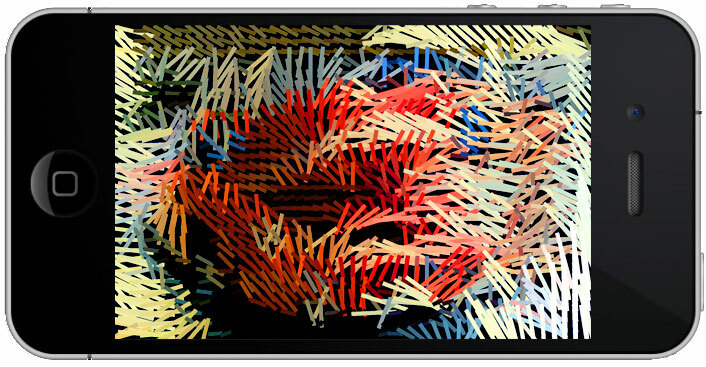 In the summer of 2009, I wrote an article here at Rhizome about the burgeoning activities of media artists creating new works or updating versions of their older interactive screen-based projects for Apple's iPhone and iTouch mobile devices. 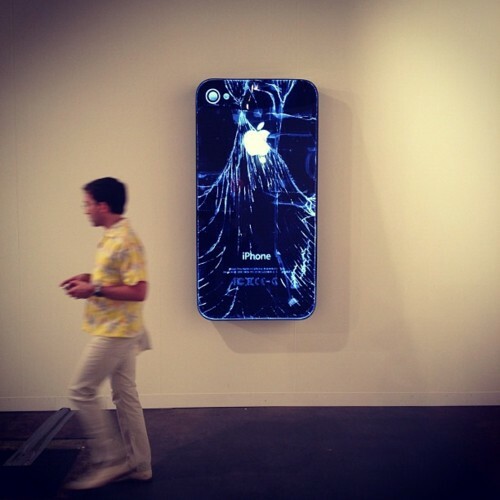 As the article made its way throughout the blogosphere, comments surfaced ranging from criticism of the "closed world of Apple's App Store and iPhone devices" to a championing of the availability of inexpensive multi-touch technology now available to artists who had been waiting for a platform that could adequately display and allow for the type of interaction their projects demanded. A year after the article came out, the draw of these devices and their potentially expansive audience has become even more irresistible to artists enough so that several more "apps" have surfaced. 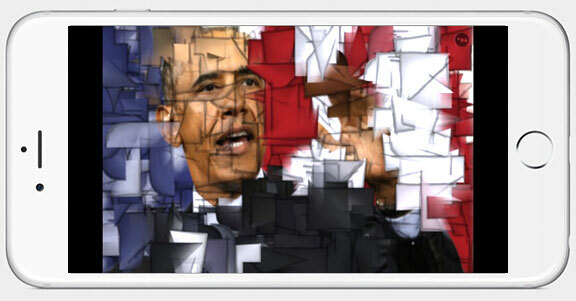 The following article catalogs several new iPhone works which have emerged over the past year, works that are pioneering the next generation of portable media art.